Miniature Roman to Large Gothic. Two type-sets always on the machine. A Special Type for Every Language, Business, Profession, and Science— instantly changeable! Write at once for illustrated folder. 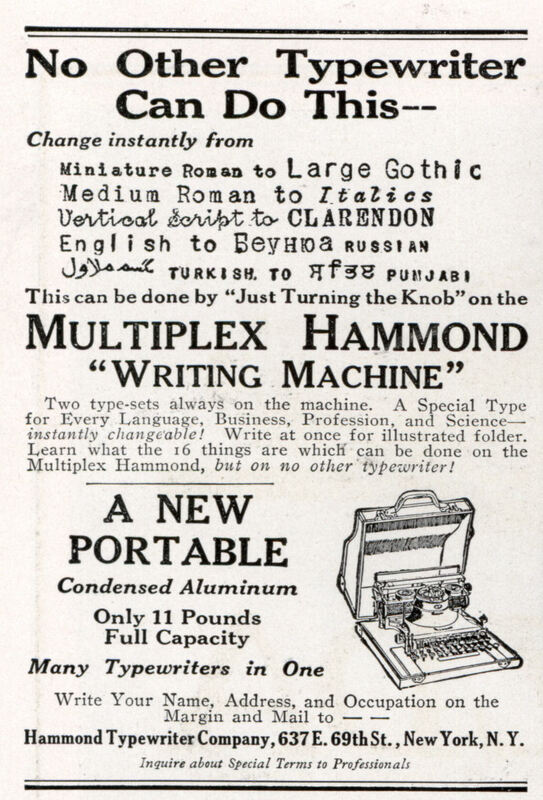 Learn what the 16 things are which can be done on the Multiplex Hammond, but on no other typewriter! Inquire about Special Terms to Professional! Odd, turkish must have changed their alphabet. Now they have fairly normal letters. Casandro, they did change their script. In Ottoman times and in the early years of the Republic, Turkish was written in Arabic script. Only in 1928 did Ataturk adopt the Turkish alphabet, which is based on the Latin alphabet. hmmmm, maybe this is the type writer Dan Rather was talking about. The IBM Selectric comes with type balls. I once worked with a Selectric that had 24 different type balls for eight different fonts in three languages. The Selectric was a special case, with its removable typeballs. Great machines – I used to repair them (in the guise of computer printers). This seems to be a cylinder design – turn a knob (somewhere – the woodcut is not all that clear) and it switches the font. This was not a machine that was going to work well for a speedy typist. BTW, whatthehell was “Condensed aluminum”? Some sort of alloy, no doubt..
Old typewriters use to have mallets* that would come up and strike the paper, each mallet would have an uppercase and lowercase letter on it. Pressing the shift key would raise the mallet. Perhaps each key had several letters on it and when you adjusted the height a different section of the key would hit the paper. 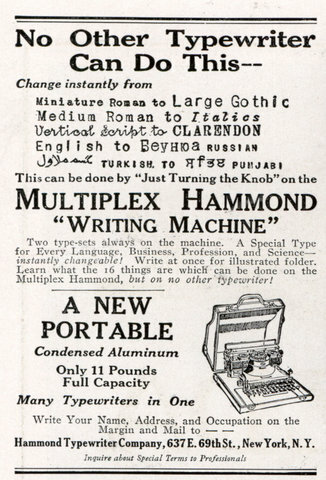 The Hammond typewriter was the original mono-spaced version of the Varityper. Fonts were on curved “shoes” which essentially made up somewhat less than 120 degrees of the circle. The cylinder could have two font shoes on it, one on the front and one on the back, so in addition to lifting the cylinder to change fonts, one also lifted it to flip it over to change between the two fonts mounted on the machine. “Condensed Aluminum” was stamped metal and much more rugged than cast aluminum which was brittle and had a tendency to crystallize and break. In fact, the word balloons in a lot of Charlton comics *were* done on a handprint-style font made for this typewriter. Interestingly, the Russian text does not say “Russian.” It says “Byeunioa.” That doesn’t sound like a real Russian word. J R R Tolkein used one of these machines to type work such as “The Hobbit” and “The Lord of the Rings”. As well as italics, it had special characters he needed to type in Anglo-Saxon, which was his day job. Wow . 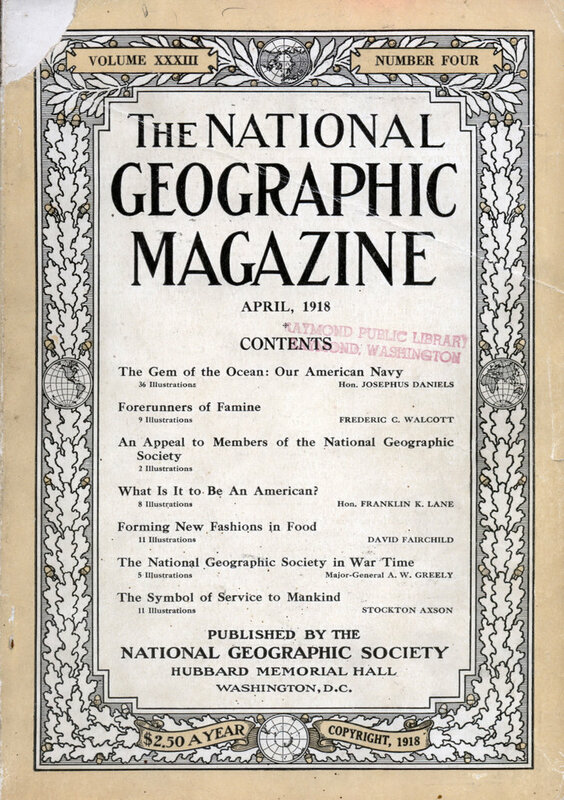 . . even 90 years ago, people could achieve homemade bad typography! Seriously, I had no clue typewriters were so fancy back then. Looks like a precursor to the Enigma machine. The Oliver stands out as well as an unusual typewriter from the 1890s. I’ve never actually seen a Hammond. Something I am having a hard time finding though are typewriter mechanics. I have a strong need to talk to typewriter mechanics for insight into the profession. Older the better. Anyone ever heard of a chatroom where they hang out? Mike (comment 3): Just what I was thinking.